A guitar pedal board, comprising several EHX pedals, including a Big Muff, POG (polyphonic octave generator), a Stereo Pulsar tremolo and a Tube EQ. Electro-Harmonix is a New York-based company that makes high-end electronic audio processors and sells rebranded vacuum tubes. The company was founded by Mike Matthews in 1968. It is best known for a series of popular guitar effects pedals introduced in the 1970s and 1990s. During the mid-1970s, Electro Harmonix had established itself as a pioneer and leading manufacturer of guitar effects pedals. Electro-Harmonix was the first company to introduce, manufacture, and market affordable state-of-the art "stomp-boxes" for guitarist and bassists, such as the first stomp-box flanger (Electric Mistress), the first analog echo/delay unit with no moving parts (Memory Man), the first guitar synthesizer in pedal form (Micro Synthesizer), and the first tube-amp distortion simulator (Hot Tubes). In 1980, Electro-Harmonix also designed and marketed one of the first digital delay/looper pedals (16-Second Digital Delay). Electro-Harmonix was founded by rhythm and blues keyboard player Mike Matthews in October 1968 in New York City. He took a job as a salesman for IBM in 1967, but shortly afterwards, in partnership with Bill Berko, an audio repairman who claimed to have his own custom circuit for a fuzz pedal, he jobbed construction of the new pedal to a contracting house and began distributing the pedals under a deal with the Guild Guitar Company. Fuzzboxes were in demand following a trail of hits involving their sound, including "(I Can't Get No) Satisfaction" by The Rolling Stones two years before, and recent popularization of Jimi Hendrix. The latter connection resulted in the pedals being branded the 'Foxey Lady'. Following the departure of his partner, Matthews was introduced to inventor and electric engineer Robert Myer through IBM colleagues. Together they designed a circuit to create a distortion-free sustain. A simple line booster used by Myers in testing to preamplify the guitar's signal was also manufactured from 1969 as the Linear Power Booster (LPB-1), and has continued production in present day. The Axis fuzz pedal, also sold under the name 'Foxey Lady' for the Guild guitar company, and LPB-1 Linear Power Booster were the first products in 1969. The LPB-1 massively boosted a guitar signal to provide gain by clipping the signal, resulting in a raw distorted sound, full of sustain and harmonics. Several similar devices, which sold well, followed, such as the Treble Booster and Bass Booster. The Mike Matthews Freedom Amp, a portable guitar amp powered by 40 "D" batteries, was popular in many venues that lacked an A/C power source. Electro-Harmonix stopped making pedals in the mid-1980s, and in the early 1990s started selling vacuum tubes re-branded with its name for guitar amplifiers, which it had also been making since the 1970s. However, due to demand and the high prices guitarists were paying for old 1970s pedals on the vintage market, it reissued the more popular old pedals in the mid-1990s, including the Big Muff Pi and Small Clone. In 2002 it started designing new pedals to add to its range. Company policy was that all reissued effects remained as close as possible to the original, vintage designs; however, casings, knobs and especially the old-fashioned mini-jack power plug were not up to later standards. In 2006 the smaller and more standardized "micro" and "nano" effect lines using surface-mount circuit components were introduced. Circuit board manufacture was outsourced, and the pedals assembled in New York. Electro-Harmonix 12AX7EH vacuum tube used in a preamp. Electro-Harmonix produces pedals with many different types of sound manipulation suitable for guitar, bass, vocal, keyboard, and other instruments. It also sells rebranded vacuum tubes carrying the Electro-Harmonix brand name. In 1969 Bob Myer and Mike Matthews designed the Big Muff Pi, a fuzzbox that added a bass-heavy sustain to any guitar sound. It is described by the company as "the finest harmonic distortion-sustain device developed to date". Originally this was intended to be a pedal that would mimic the fuzz tones of Jimi Hendrix and other guitarists at the time, but the result was a mix of a fuzz and distortion pedal with a very heavy sound. It also made small amps sound much better and allowed distortion at any volume. The pedal sold well and was used by Carlos Santana, Pink Floyd's David Gilmour, Alex Lifeson of Rush and, later, Metallica's bassist Cliff Burton, The Jesus and Mary Chain, and in the 1990s KoRn's rhythm guitarist Munky, Jack White of The White Stripes, J Mascis of Dinosaur Jr., The Edge of U2, and Billy Corgan (on The Smashing Pumpkins landmark album, Siamese Dream). The band Mudhoney titled their debut EP Superfuzz Bigmuff. 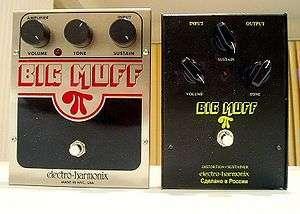 Although the first Big Muff production date was for many years cited as 1971, the first version of the Big Muff was actually sold in 1969 as a hand-made "perf board" version. A production version with an etched PCB board was made in early 1970. Mike Matthews was friends with Jimi Hendrix and claims Jimi bought one from Manny's Music in New York, shortly after they were released and had one in the Electric Lady Studios shortly before Jimi's death in 1970. Several variations of the Big Muff Pi followed throughout the 1970s. As of 2012 Electro-Harmonix produced a reissue assembled in New York City; until 2009 it produced a version made by Sovtek in Russia which provided a slightly different tone. The Bass Big Muff replaced the Russian version. Several other variations (some of which are not actually Big Muffs) of the pedal were in production as of 2012, including the Metal Muff (intended to achieve the higher gain Metal guitar sound), the Double Muff, which incorporates the original Muff Fuzz circuit, twice in series with a single overdrive control for each circuit, providing the user either with a cascaded 'Double Muff' sound or the original Muff Fuzz circuit, the Little Big Muff, a smaller version, and a variation in circuit, of the NYC Big Muff, which produces yet another variation in sound, and the Big Muff with Tone Wicker, which is similar to the 2008 revision NYC Big Muff, with two added features: a tone bypass switch allowing you to bypass the tone control and a switch that adjusts the frequency of three high frequency filters in the circuit. Electro-Harmonix often produces a range of pedals based on a single effect, and then combines two or more into higher end units. For instance, the Epitome combines the MIcro POG, Stereo Electric Mistress, and Holy Grail Plus into one effect unit. The widely used Small Stone phase shifter is a 4-stage phaser designed by David Cockerell, whom Electro-Harmonix hired from his former employer EMS. The phased sounds of French composer Jean-Michel Jarre depended heavily on the Small Stone unit. It was reissued years later by EHX and a smaller version of the pedal was eventually introduced in a 'Nano' casing (officially called the "Small Stone (Nano Chassis)"). The Small Clone chorus is a very popular chorus pedal, used by Kurt Cobain, both live and in studio. Like the Small Stone, it is issued in both the standard size and two different smaller versions (the Nano Clone is a more economy offering, while the neo clone is the standard). The Electric Mistress is an analog flanger. It had first been sold in 1976 and was by that the first flanger in pedal format. The Deluxe version has been reissued and is still in production, although in 2015, a new Deluxe Electric Mistress was introduced in the company's smaller "XO" casing. As well, there are two digital recreations called NEO Mistress and Stereo Electric Mistress. Except for the very first blue/red version the Electric Mistress featured a "Filter Matrix mode" which allowed the user to freeze it at any point in the flange, offering distinctive chime-like tones. On the Neo and Stereo Mistress, this is achieved at a certain setting on the "rate" knob. Notable users include David Gilmour, Todd Rundgren, Alex Lifeson, Robin Trower, Andy Summers of The Police, J Mascis of Dinosaur Jr. and ex-Red Hot Chili Peppers guitarist John Frusciante. The Flanger Hoax pedal is a more advanced unit, allowing further control of the various parameters of phaser, flanger and chorusing effects. The Polychorus allows highly adjustable chorus, flanger, filter matrix, and slapback echo effects. Notable users include Cobain (i.e. Radio Friendly Unit Shifter), Adrian Belew, and more recently Ryan Jarman of The Cribs. Electro-Harmonix's 'XO' line added the Stereo Polyphase, an analog optical envelope- and LFO-controlled phase shifter. Electro-Harmonix also manufactures delay pedals, including the Deluxe Memory Man, Stereo Memory Man with Hazarai, and #1 Echo. They also produce the '2880' pedal, which allows complex looping and multi-track overdubbing. The #1 Echo provides basic digital echo capability, while the Deluxe Memory Man provides more control over length, repeats, etc. The Deluxe Memory Man also includes built-in chorusing and vibrato effects. The digital Stereo Memory Man with Hazarai (distinct from the Analog Deluxe Memory Man) also includes reverse echo effect and looping/overdubbing. The Memory Toy and Memory Boy delay pedals are essentially smaller budget versions of the Deluxe Memory Man. The Memory Man effects pedal was used by Edge from the band U2 to record the songs "I Will Follow" and "Sunday Bloody Sunday". One of the singles from the band Deerhunter's 2010 album Halcyon Digest was named "Memory Boy". The Holy Grail, Holy Grail Plus, Holier Grail (discontinued), Holiest Grail (discontinued) and Cathedral pedals produce reverberation. These cover a range of capability, including reverb length, room simulation, etc. The company's Holy Stain multi-effects pedal also includes two different types of reverb. Tremolo and vibrato are included as well, in both solid-state and vacuum tube options. These are available in the Stereo Pulsar (solid-state) and Wiggler (tube) pedals. Also available are a series of pitch modulation pedals. These include the Micro Synthesizer (for bass or guitar), HOG (Harmonic Octave Generator), POG (Polyphonic Octave Generator, released in 2005), POG 2 (2009), Micro POG (in an XO casing), Nano POG, Octave Multiplexer, and Pitch Fork. The POG line of pedals has been used extensively by several prominent 2000s-era rock guitarists, including Jack White (of The White Stripes, The Raconteurs, etc. ), and Josh Homme (of Queens of the Stone Age, Them Crooked Vultures, etc.). Electro-Harmonix offers several pedals for envelope/equalization modulation. Amongst them are the Bassballs (appropriately named for its intended use with bass guitars), Doctor Q and the Q-Tron. Another pedal of note was the vacuum tube-powered Black Finger Compressor which adds distortion-free sustain to the sound and which appeared in the mid 1970s. The solid-state White Finger followed. In 1995, Electro-Harmonix owner Mike Matthews commissioned Mike Beigel, former owner of Musitronics Corp. and inventor of the Mu-tron III envelope filter, to design a new envelope filter using the same analog circuitry as the original Mu-tron III, thus keeping the sound as close to the original as possible while adding new features to bring the effect into the new millennium. The pedal featured the same controls as the Mu-tron III and incorporated a "Boost" feature, which activates an internal pre-amp and changes the function of the gain knob giving the Q-Tron a sound almost identical to the Mu-tron III. Another feature added to Q-Tron was an effects loop switch and attack response switch. Units with these features are called the Q-Tron+. A smaller more compact version, the Mini Q-Tron, is also available, as well as an even smaller version, the Micro Q-Tron. Additionally, Electro-Harmonix produces several other pedals. These include the Graphic Fuzz (a fuzzbox which includes an EQ section), the Frequency Analyzer (which creates ring modulation) and the Voice Box, a vocoder. The Voice Box has been included in a series of demonstration videos produced by Jack Conte. Electro-Harmonix has also made a few small power amp pedals for use as a simple guitar amplifier. The EHX 22 Caliber was a 22 watt solid state pedal capable of driving either an 8 ohm or 16 ohm speaker cabinet. It has been discontinued. The 22 Caliber was replaced in the lineup by the EHX 44 Magnum, a similar pedal capable of driving the same speaker load, but at a 44 watt output. Several pedals produced in the decades prior have also been discontinued, many of which are still in high demand for their unique sound. 1 2 "The Big Muff History of All Versions Part 1". Kitrae.net. 1970-09-25. Retrieved 2014-08-21. ↑ "The Big Muff History of All Versions Part 1". Kitrae.net. Retrieved 2014-08-21. ↑ "Jimi Hendrix Big Muff". Kitrae.net. Retrieved 2014-08-21. ↑ "The Big Muff History of All Versions 3". Kitrae.net. Retrieved 2014-08-21. ↑ "EHX.com | Epitome - Multi Effect | Electro-Harmonix". www.ehx.com. Retrieved 2016-07-18. ↑ "The Definitive Kurt Cobain Gear Guide". 2016-02-20. Retrieved 2016-07-18. ↑ "EHX.com | Flanger Hoax - Phaser/Flanger Modulator | Electro-Harmonix". www.ehx.com. Retrieved 2016-07-18. ↑ "EHX.com | Stereo Polychorus - Analog Chorus/Flanger/Slapback Echo | Electro-Harmonix". www.ehx.com. Retrieved 2016-07-18. ↑ Leslie, Jimmy (September 9, 2010). "Jack White Mega Sonic On The Sounds That Drive The White Stripes Raconteurs and Dead Weather". Guitar Player. New Bay Media, LLC. Retrieved September 26, 2015. ↑ Wolfert, Jamie (June 11, 2015). "Tones for the Deaf: Nailing Josh Homme's Sound". Tone Report. Stompbox Music, LLC. Retrieved September 26, 2015. ↑ "Voice Box Demo by Jack Conte and Nataly Dawn". Electro-Harmonix. January 6, 2009. Retrieved July 25, 2009. ↑ "22 Caliber - Power Amp - DISCONTINUED | Electro-Harmonix". EHX.com. Retrieved 2014-08-21. ↑ "44 Magnum - Power Amp | Electro-Harmonix". EHX.com. Retrieved 2014-08-21.